There are far more counterfeit coins in circulation than you might think. Around one in every 40 £1 coins is a fake. That’s a staggering figure and it equates to £41 million in counterfeit pound coins. The difficulty lies in spotting the fakes. After all, who really looks at a pound coin? We put them in a pocket or purse and then count them out when we need them. But it’s illegal to pass on counterfeit coins, even if it’s done unknowingly. Part of the problem in identifying counterfeit pound coins is that the design on the reverse side is changed every year. Most people simply can’t keep track, and that’s understandable. That said, there are some simple things that can give away the more obvious counterfeits – the really good ones can only be detected by experts. If the colour of a particular coin seems to be different from other pound coins you have, there’s a good chance it’s a fake. Similarly, counterfeit coins won’t be as well made as the real thing. Look at the milling on the edge; the definition of it will be poor, and the images of the queen and on the reverse will not be clear and sharp, the way they should be. As the coins age, genuine pound coins lose their sheen and look duller. In contrast, the fakes retain their shine, making them relatively easy to spot. Another method that requires a closer inspection is that genuine coins will have the proper orientation. This means that the portrait of the Queen should sit square on the front. When turned over, the image on the other side should have its top and bottom in the same orientation as the portrait. Part of the reason the designs on the reverse of the coins change annually is to defeat counterfeiters. The Mint has charts of what design matches which portrait, and what are the correct inscriptions. Checking all your pound coins against this chart takes time and effort, but if you’re concerned about fakes it’s worth the time. You might also find that the letters in the inscription aren’t spaced as evenly as they should be. The number of fake pound coins has risen dramatically in the last few years. 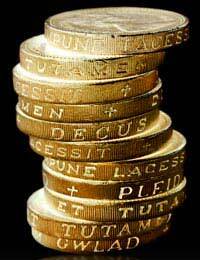 In 2007 there were 30 million fake pound coins and the figure has gone up 26 per cent since then. Since the fakes usually don’t work in vending machines of any kind, if you have one that keeps being rejected by the pay and display parking machine, the odds are that it’s a fake. Pound coins are counterfeited much more often than other currencies. By comparison, only 10 million Euros are counterfeit, according to reports. The real danger with so many counterfeits is that it can lower the confidence in the currency. People could refuse to take pound coins. If that happened it would have a big effect, especially on small shopkeepers who do so many small transactions. It’s something no government can afford. This is why it’s vital to keep ahead of the counterfeiters and to track them down. In 2007, for instance, a man was convicted for producing 14 million fake pound coins. Getting someone like that put away can only help us all.